Benvenuto! Grand Canal Shoppes are an extraordinary Venetian-inspired shopping and dining duo, home to over 160 signature stores and luxury brands plus more than a dozen world-class restaurants. Also worth mentioning are the six prestigious art galleries and scrumptious creations of five celebrity chefs. Rounding out our list of favourites, it has to be Barneys New York, Coach, Links of London, Swarovski, Burberry and Jimmy Choo. Dining choices are out of this world. We adore Buddy V's Ristorante, the Cake Boss' first classic Italian restaurant is divine and right next door is the Carlo's Bakery, so you can grab a cannoli for later. If you haven't yet enjoyed a Sushi Samba experience - now is the time. The blend of Japanese, Brazilian and Peruvian flavours is small plate heaven. 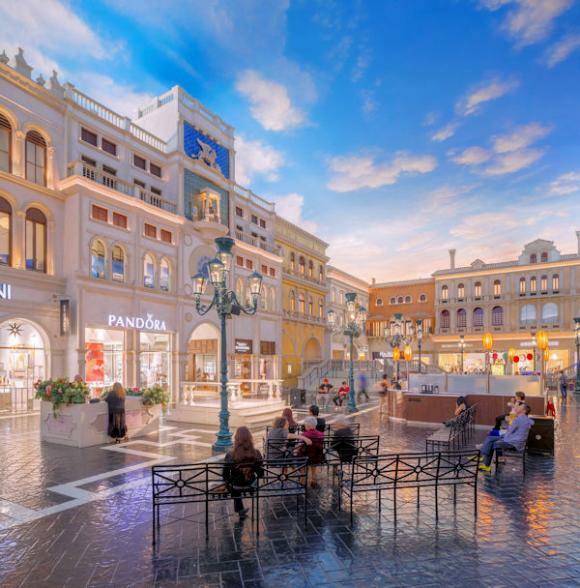 Part of the charm of Grand Canal Shoppes is Streetmosphere® an international roster of classically trained singers, actors, and musicians performing daily through-out the center. Living statues amaze guests with their immovable poses, while a troupe of talented musicians, wander the cobbled streets and serenade shoppers. On any given day, there are approximately 30 small performances delight the unsuspecting.